The Duke and Duchess of Cambridge have today carried out engagements in Dundee, Scotland. When attending official engagements in Scotland, William and Kate take on the title of Earl and Countess of Strathearn. 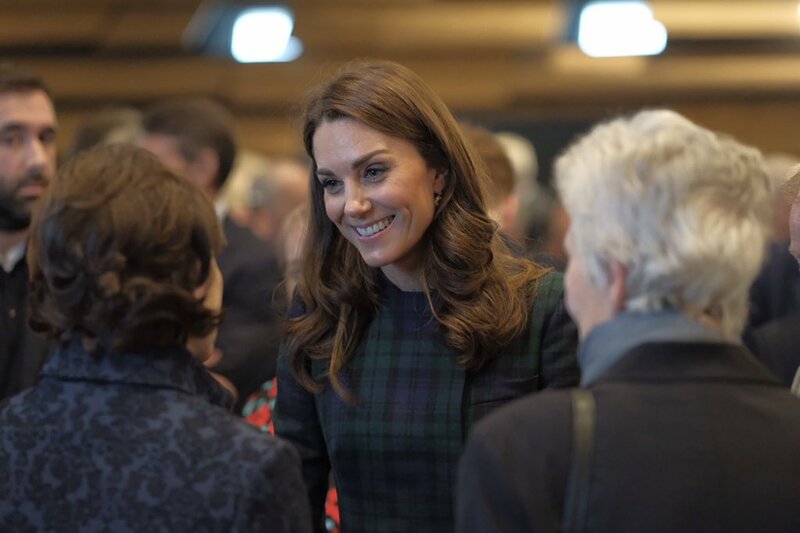 Kate was very fittingly dressed in her black watch tartan coat. The Duchess wore her bespoke Alexander McQueen black watch tartan coat, that is a variation of the McQ for McQueen runway tartan coat; this was part of the Autumn/Winter Ready to Wear 2012 collection. McQ is a diffusion label of Alexander McQueen, meaning it sells at a lower price point and is more affordable and accessible to customers. However, this particular piece was priced somewhere over £4,345. The 2012 collection featured numerous black watch pieces for both men and women. The fashion world adopted black watch tartan as a must have luxe item for clothing such as coats, blazers and trousers. However, black watch is actually an infantry battalion of the Royal Regiment of Scotland and the particular tartan of thick dark green strips interwoven with dark blue stripes and thinner black stripes was in fact part of the battalion’s uniform. The tartan is thought to have been created in the early 1700’s. A McQueen piece very similar to this style (and also another of Catherine’s McQueen coats) is still available for purchase here. The Duchess of Cambridge carried a new bag by Manu Atelier today. Kate carried the ‘Micro Bold Cross-Body Bag’ style in Monte Green colour-way, retailing for £424. We recognised the brand straight away from its very distinctive gold logo plaque which appears to be a combination of a broken letter ‘A’ and a north pointing arrow on the lock. The round-top handle bag is made up of dark green leather accents at the top and bottom of the bag with a rich dark green suede in the centre, with an optional silver cross-body chain strap. Manu Atelier has become quite popular over the last couple of years. We are very excited to see Kate experimenting with new labels and bags and pushing her own fashion envelope further. The bag is still available to purchase in blue here you can try a slightly different bag from the label in dark green here. Kate wore her tried and tested Tod’s pumps. The black suede pointed toe block heel pump feature the brands signature pebbled traction rubber grip sole. Unfortunately, these shoes are sold out. You can try these here for a great match or these for an even cheaper high street option here. The Duchess accessorised with Diana’s sapphire and diamond halo double drop earrings. The delicate sapphire drops have a floral pattern and hang from a singular diamond stud. Catherine added a dark green cashmere scarf with fringing at either end that has yet to be identified. Try this to copy Kate’s look here. Kate wore her Cornelia James ‘Imogen’ merino wool gloves with twisted bow accents at the wrists, retailing for £75. You can purchase Kate’s gloves here.